Sacramento Self Storage at 5051 Perry Ave. 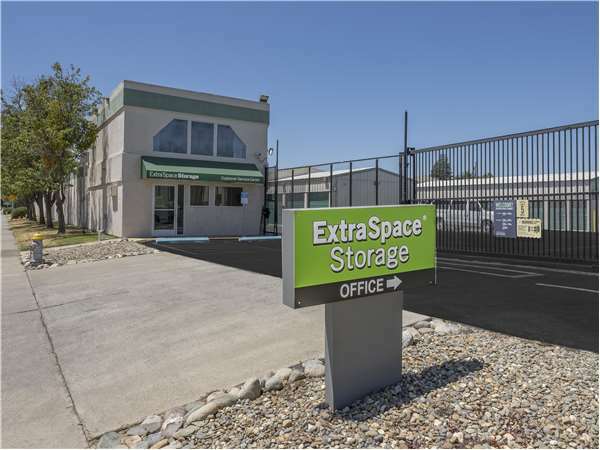 Located on Perry Ave. just west of Stockton Blvd., Extra Space Storage serves Sacramento residents near Tahoe Park South, Colonial Heights, Hillside Terrace, Granlees, Arnold, Traction, Grenz, Mello Park, Isabel Park, Fruitridge Heights, Fruitridge Oaks, and Lawrence Park. Locals will recognize our facility near La Superior Market, GS1 Motors, and Colonial Heights Library. We're also accessible for residents of nearby apartments, such as Mercy Housing Boulevard Court, Dewey Gardens Apartments, Mendocino Plaza, Shiloh Arms, Heidi Lynn Apartments, Greystone Place, and Cascade Apartments. Since Extra Space Storage is about 3.4 miles from California State University Sacramento, we're the go-to solution for college students who need to store belongings over the summer or while studying abroad. Extra Space Storage on Perry Ave. has a large selection of storage units, vehicle storage, and exceptional security, so we can handle almost any storage need you have. We're the solution for you in Sacramento! Our Sacramento location offers storage units as small as 25 square feet and as large as 420 square feet. This facility has outdoor vehicle storage and drive-up access units as well. If you need to store a vehicle in Sacramento, Extra Space Storage offers 8x15 to 8x30 outdoor parking spaces and 10x10 to 12x35 drive-up units that can accommodate vehicles of all sizes. With 24-hour video surveillance and electronic gate access, you can rest easy knowing your belongings are well-protected at our Perry Ave. storage facility. At Extra Space Storage, we strive to provide high-quality, affordable, secure self storage. More importantly, we know great customer service is something our customers want. That's why our friendly, professional staff is available to help with whatever you need. Contact us today to reserve a storage unit in Sacramento! Even with the remodeling, and working out of a temporary office, Shon was thorough and knowledgeable. The computer signature for the contract was efficient. The price and location are great for me. Extra space storage has very good customer service !! Not only that they have great deals !!! I got my first month free paid under 60 cant beat that !!! Great customer service. First month price is great. Clean facility. I love the Extra Space Storage location on Perry Ave. The manager there is friendly and helpful. I have always had excellent service in the 5 years that I have rented a unit. Awesome place to store your most precious valuables. Very neat and clean. Great staff, and great rates too! Brianna Is wonderful! Very informative and not pushy!! She was patient with us and answered all of questions. The employees are outstandingly friendly and helpful! I was walked through the process and explained everything, as this was my first time needing storage due to a move. The staff are VERY knowledgeable and informative. Great Store! I have nothing but good things to say about this facility, very clean, well kept and the most pleasant, friendly and helpful staff I have ever encountered using storage facilities. I have not had any of the problems here that I found in other storage units like mice or wind blown dirty units. Having this unit has most definitely made my move easier, and if I wasn't leaving town, would certainly rent storage here again. Your facility is really nice and clean. I like how other renters hang out in their units all day. That's pretty cool. It is like having neighbors at my storage unit. Great facility.. Very clean, convenient, but I don't like having to get out of my car to enter a security code both ways & great Customer service! I had a over all great experience. Great customer Service i received from Ken and Kristina. Always nice and pleasant to talk to. The facility was always clean. Facility is convenient to my home, very clean, and manager was extremely helpful and courteous. I needed a large unit and this location was the only one in the area that had a unit larger than a 10x30 with very tall ceilings. Will recommend to friends and family. I have been renting with extra space for 2 years now, I have been VERY happy with their staff and facility amenities. Example: Great and very convenient gate access hours and 24 hour survallence. I would reccomend this facility and compay to anyone who needs storage!! The staff at this facility were helpful and friendly, going out of their way to provide me with all the information I needed to make my selection of a storage unit. When it came time to sign the agreement, a computer was available for me to view, make changes and digitally initial and sign. Quick and easy! And, $29.00 was all I paid as the first month's rent was free! Oh, and the friend that told me about this place got $50 off her rent! From Highway 99, take the Fruitridge exit to the east. Go til you reach stockton Blvd ( approximately 1.3 miles) Stay in the left lane. There will be a Rite Aid on your right. Turn North onto Stockton Blvd. and go approximately .7 miles. After passing K-Mart on your left side, stay in the left lane. Then turn left onto 21st Ave. 21st ave merges onto Perry Ave. We are on the right. From Highway 99, take the Martin Luther King Blvd exit. Turn right onto Fruitridge. Go til you reach Stockton Blvd ( approximately 1.3 miles) Stay in the left lane. There will be a Rite Aid on your right. Turn North onto Stockton Blvd. and go approximately .7 miles. After passing K-Mart on your left side, stay in the left lane. Then turn left onto 21st Ave. 21st Ave merges onto Perry Ave. We are on the right. Take 50 west towards San Francisco. Take the Stockton Blvd exit. Turn South onto Stockton Blvd. Go Approximately 2 miles. Stay in the right lane. Turn West on 21st Ave. 21st ave merges onto Perry Ave, - we are on the right. Take 80 east to 99 south. From Highway 99, take the Fruitridge exit to the east. Go til you reach stockton Blvd ( approximately 1.3 miles) Stay in the left lane. There will be a Rit Aid on your right. Turn North onto Stockton Blvd. and go approximately .7 miles. After passing K-Mart on your left side, stay in the left lane. Then turn left onto 21st Ave. 21st Ave merges onto Perry Ave. We are on the right.